There are many reasons to introduce plants into your tank. From oxygenating the water to providing shelter, plants will keep the tank, and the fish much healthier. Hornwort is one of the easiest freshwater plants to grow. This is demonstrated by its success in the wild where it has spread to every continent except Antarctica, after originating in North America. Its high tolerance to various water conditions makes it ideal for beginners, while its fast growth rate and ease to propagate means a little will go a long way. It can be used as either a floating plant or rooted in the substrate, giving you more freedom when designing the look of your aquarium. This also increases the range of freshwater fish that can benefit from it. If you are looking for an easy, fast-growing plant then hornwort could be for you. Here is a brief summary of what you should expect. 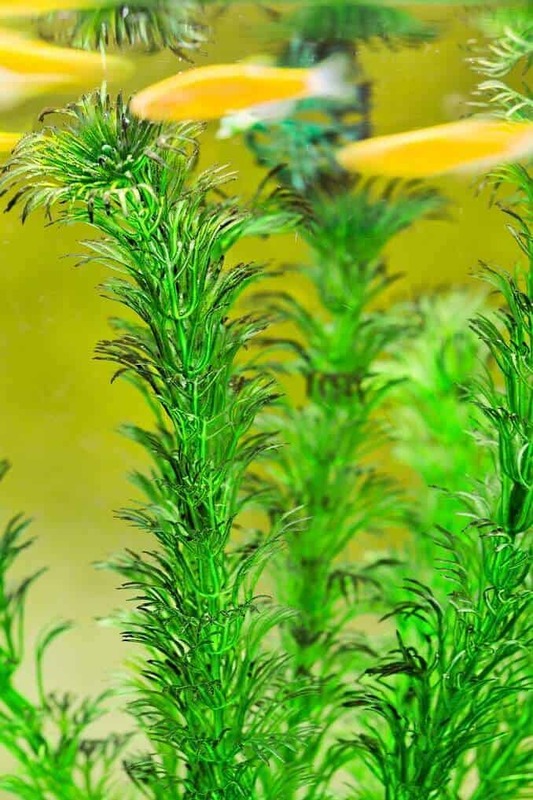 Is Hornwort Suitable for Your Aquarium (Summary)? Hornwort, or Ceratophyllum, is a popular freshwater aquarium plant. The number of species is uncertain. Over 300 species names have been published, but there are likely only 100-150 species due to misidentification. The most common species for an aquarium is Ceratophyllum demersum. Its hardy nature makes it ideal for beginners or those looking to introduce a non-fussy plant to their tank. While being hardy is useful in an aquarium, in the wild it can cause problems. Its tolerance to a wide range of conditions, coupled with a fast growth rate, allows it to spread to new areas as an invasive species. This has become a problem in places such as New Zealand where it is out-competing native plant species and disrupting hydroelectric power generation. Another reason for hornwort’s success is that it has allelopathic abilities. This means that it can produce chemicals which prevent the growth of other species, leaving more space and nutrients for itself. The achievements of this plant are demonstrated by the numerous locations it can be found across the globe – it has cosmopolitan distribution. This plant now exists on all continents except Antarctica. The popularity of this plant creates a high demand and as a result it is stocked in many stores. Since this species grows rapidly, it can be produced in high densities very cheaply, so it is usually sold cheaply. A few bunches of hornwort will cost in the range of $5-$10, but prices per plant will vary between retailers and depending on how many you buy at once. One of the main reasons that people add hornwort is for its aesthetic. Adding plants to your tank increases the amount of color, whether it is at the top as a floating plant or grounded in the substrate. It also gives your aquarium a new dynamic as it sways in the current. What people do not often consider is how it keeps your tank healthier. As a plant, hornwort photosynthesizes. The main byproduct of photosynthesis is oxygen. 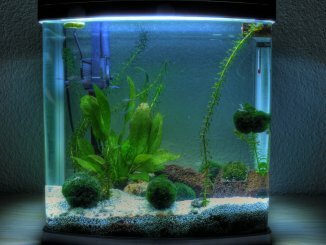 As a result, it will oxygenate the tank for your fish. Furthermore, it provides areas of shelter for fish looking to escape each other or the light. Plants like this may be used as a nursery for fry as well; another great plant for this is java moss. Occasionally they will shed some debris, but this will likely be used as food by scavenging fish. Finally, it helps improve the quality of the water. It takes in small amounts of the waste that fish produce, as well as nitrogen compounds, keeping the water cleaner and lightening the workload for the filter. Lastly, the allelopathic abilities that we have already mentioned above, can inhibit the growth of blue-green algae (cyanobacteria). This is an alga that can quickly get out of control in conditions with too much light or lots of organic waste. Typically, one plant will have many stems, creating the look of multiple plants. Hornwort lacks true roots, but certain leaves function to help anchor the plant in the substrate. It may also grow rhizoids (hair-like roots) to help anchor the plant. If left to its own devices, anchored stems could grow all the way up to the surface of your tank with 0-3 branches per node. In a natural habitat, it can reach 10-feet long and 1/10-inch in diameter. Leaves (or needles) are produced in whorls of six to twelve. They tend to fork once or twice but remain relatively short, generally less than one inch. In most instances this is a dark green plant, though lighter green shades can occur in warmer environments. Hornwort is a flowering plant which is important for reproduction. Both male and female flowers are found on the same specimen, making it a monoecious plant. Do not expect much color from the flowers as they are brown and only 1/10-inch long. The flower produces fruit in the form of a nut which is around 1/5-inch in size, with three spines. Naturally hornwort inhabits lakes, rivers, ponds, and marshes. Each of these environments have their own different structural components. The broad scope of these natural habitats means that there is no one right way to design a tank to cater for hornwort. It should remain healthy in most setups. This includes a range of tank sizes since it will grow to fit big tanks and can be regularly pruned to fit small tanks. 15 gallons should be the minimum tank size or the plant may quickly get out of control with its fast growth rate. They are comfortable in a range of temperatures, roughly 59-86°F. Consequently, it is often incorporated into both cold-water and tropical setups. Similarly, pH can range from 6.0 to 7.5 while hardness should be 5-15 dGH. Filtration is required to keep nitrogen compounds low (ammonia, nitrites and nitrates), but there are no special requirements. The few demands they have are focused around photosynthesis for growth. These include a high light intensity and clear water to allow the light to penetrate throughout the tank. Keep your water clean by performing regular partial water changes. When kept with other plants, hornwort will quickly diminish the tank’s supply of nutrients. If this is the case, then it may be wise to add a fertilizer each week to maintain supplies. We have already mentioned that hornwort can be anchored in the substrate. However, it can also be left to float at the water’s surface. But which is best? 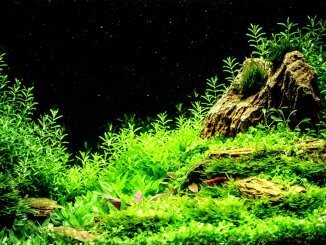 It really depends on what aesthetic you are going for when aquascaping, as well as considering the preferences of your fish. Whether planting or floating, they makes excellent shelter for small fish, with many species using it as a site to reproduce and keep fry safe. At this point you need to consider which fish you have. Surface dwelling fish (such as hatchetfish) would appreciate floating hornwort whereas fish in the mid to lower levels (such as tetras or loaches) would prefer it to be planted. Looking beyond shelter, floating plants provide shaded areas in the lower levels. This gives fish space to escape the light, which can really bring out their colorations. While showing off the colors of fish below, floating it on the surface also adds a pleasant aesthetic to an area which is often devoid of attraction. Make sure to avoid planting it close to a filter inlet so that it does not get blocked by any plant debris. Since hornwort does not have roots it can be planted in most substrates, though fine-grained sands are preferable to secure the bottom leaves of the stem. It is known to grow very rapidly. There is no exact growth rate because it is dependent on a variety of factors, though it is not uncommon for it to grow 5 or more inches within a week. To increase the growth rate, ensure that the plant is receiving a high intensity of light. This can be done by changing the light fitting and making sure that nothing is shading the hornwort. More light results in a larger, greener plant. A warmer tank will have the same effect as a brighter tank. Be careful to consider the effects of changing the temperature on any other life in your tank. 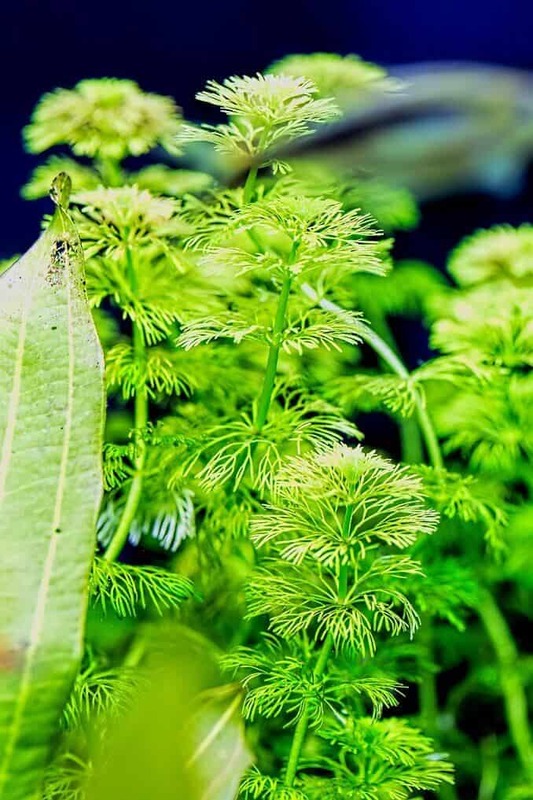 A healthy tank should supply hornwort with adequate amounts of nutrients, but if it is in competition with other plants then adding nutrient supplements each week could improve the plant’s growth. When at its desired length, it needs to be maintained. This involves watching for further growth and cutting the stem from the top to get the plant back down to the ideal size. Cuttings will have to be taken every now and then, whenever you see the stems getting out of control. Due to its rapid growth rate, a common problem is that it becomes too large and begins to dominate the tank. With regular maintenance and cutting of the stems this should not be an issue. Their large potential size has made it popular for ponds, but even in this environment its length needs to be regulated. Maintaining the size of floating hornwort is especially important so that it does not cover the surface and prevent light reaching the bottom of the tank. This could kill any grounded plants. Another common problem is how much it can shed. Though not always the case, hornwort may shed its needles at an intense rate. This is more likely when it is first introduced to the tank, while it gets used to the setup, so do not worry if you see shedding initially. They will always shed in small amounts, but if it is happening more than usual then it is likely that the temperature in your tank is too high. If safe to do so, try lowering the temperature and test the nutrient levels to ensure they are at the normal levels. Given it’s success in the wild, you would expect it to be easy to produce new plants. Hornwort propagates via vegetative fragmentation, a common technique for invasive plant species. This is where one part of the plant is separated from the rest; it then grows to form a new plant. The main stem grows multiple side shoots that may become detached. It could be a whole stem that separates, or even just a small section from the top of a stem. In autumn, buds form at the end of the stems. These are released and sit at the bottom of the tank throughout winter before forming new plants in spring. However, this is much rarer in captivity compared to vegetative fragmentation. If you are looking to multiply the amount of hornwort in your aquarium, try cutting off a side stem and planting, or floating it elsewhere. Over the next couple of weeks this should develop as a new plant. Compatibility with fish is not generally a big concern since hornwort makes a good companion for all fish. That being said, it is better paired with some fish over others. Live-bearers will benefit more than most. 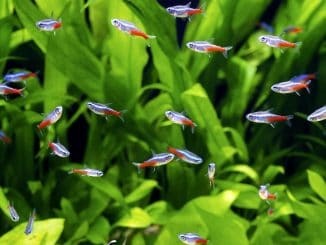 Fish such as Common Mollies or Guppies will use the plant as a refuge for fry when mating. They can also become a food source for some fish. Species such as Gouramis or Angelfish will eat the plant, so bear this in mind when choosing your fish. Snails, shrimp, and scavenging fish (e.g. loaches) are great at clearing up any debris shed from the plant, keeping the bottom of the aquarium looking cleaner. Hornwort has very few demands and is therefore likely to be suited to your aquarium. It is a hardy plant making it more ideal for beginners. It is multi-purpose, improving the safety of young fry while also keeping fish waste and algae levels down. Its’ ability to function as a floating plant makes it a rare point of interest for surface-dwelling fish, while planted alternatives provide shelter to fish from the lower levels. 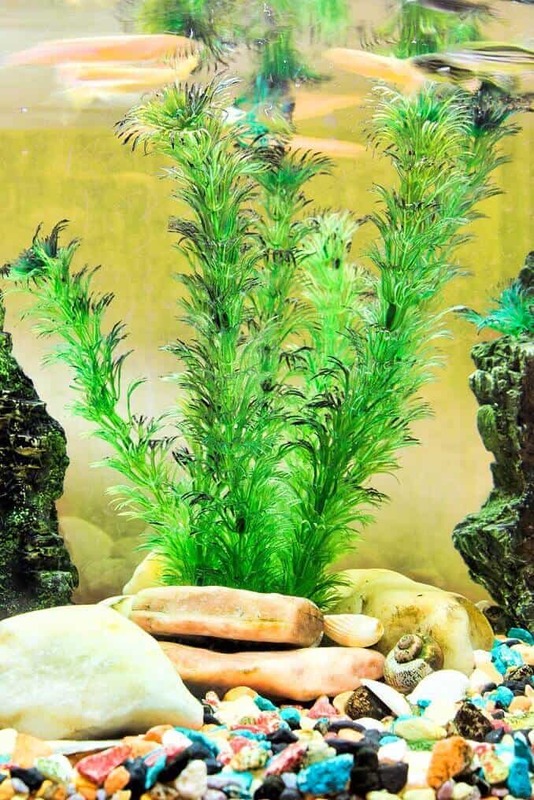 If you are prepared for regular trimming of the stems to prevent it dominating the tank, they will make an attractive addition to most aquariums. I can’t manage to keep hornwort alive in my 100 gallon, unless my fish are just eating it faster than it can grow!